The opening 10 minutes of Naughty Dog’s The Last of Us are the most incredible and emotionally impactful moments in a video game I have ever experienced. These moments set the tone wonderfully and resonated with me throughout the game’s entire 16 plus hour emotionally gruelling experience. In fact, I will say this right now – The Last of Us has the best story in a video game I have ever been told. Up until The Last of Us, developer Naughty Dog has been known for their light-hearted, humorous fare like the Jak and Daxter series and the most recent Uncharted games for the PlayStation 3. The Last of Us is without a doubt the anti-Uncharted. The game’s definitely share the same DNA: beautifully rendered, well written, incredibly well acted, great pacing, atmosphere, great and tense moments of action, and a fantastic sense of world-building. Where these games diverge wildly is the tone. The Last of Us is bleak. It’s gorgeous, poignant, wonderful, dangerous and depressingly bleak. I did not have “fun” playing this game, not in the traditional sense of the word, but I was utterly fascinated by the story and the world on display from the first frame to the last. 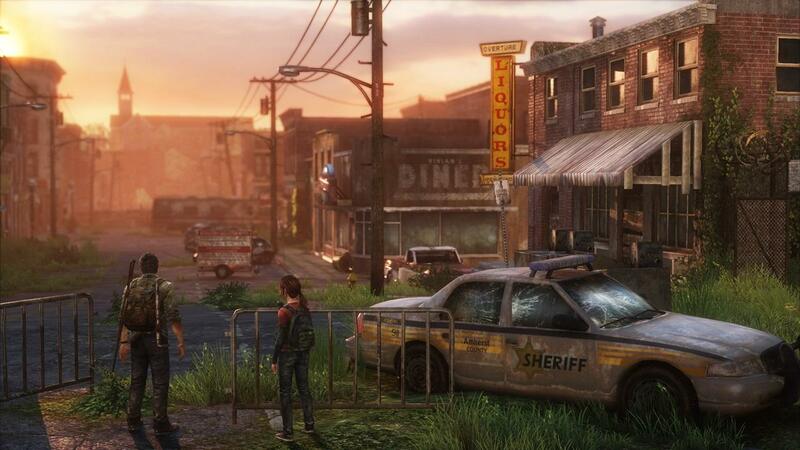 The level of detail in the world building in The Last of Us is staggering and unrivaled. The plot of The Last of Us is hardly original. A pandemic that’s decimated the world has created zombie-like creatures, bringing out the very worst traits of humanity. It’s up to a world-weary, cynical, weathered “veteran” and the naïve ward in his care to save humanity. The unlikely pair embark on a cross-country road trip and all the while they encounter supporting characters and have mini arcs along the way. There are plenty of well-worn tropes in The Last of Us but when the story is told this well, it’s difficult to care. For years, video games have been chasing cinema as some sort of goal post for the stories they want to tell. The Last of Us should go forth as the benchmark for those goals as it succeeds in every conceivable way. The story being told in The Last of Us is quite simply, brilliant. The script by Neil Druckman (Uncharted 2: Among Thieves) paints an incredibly detailed world with rich characters and sharp, natural dialogue. Like all the best apocalyptic horror stories, what works best is the characters and focusing on how man will survive and to what lengths they will go in order to do so. Not a single character action rings false or inconsistent. It’s a master class in storytelling in games so much so that it will be very hard for anyone to top, including Naughty Dog. And knowing that Druckman worked on The Last of Us instead of Uncharted 3: Drake’s Deception goes a long way to explaining why that game wasn’t as strong as it’s predecessor. Make no mistake about it; Druckman deserves the lion’s share of the accolades because it’s his words that make this story resonate. 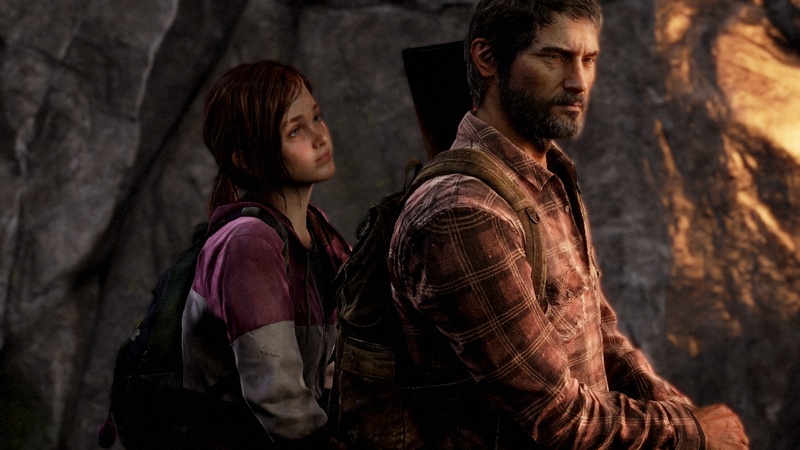 The relationship between Joel and Ellie is touching and is the heart of The Last of Us. Discussing the story of The Last of Us in any detail is impossible to do without spoiling it because, as much as the plot relies on tropes and genre clichés, the story takes the familiar and offers plenty of truly satisfying surprises. 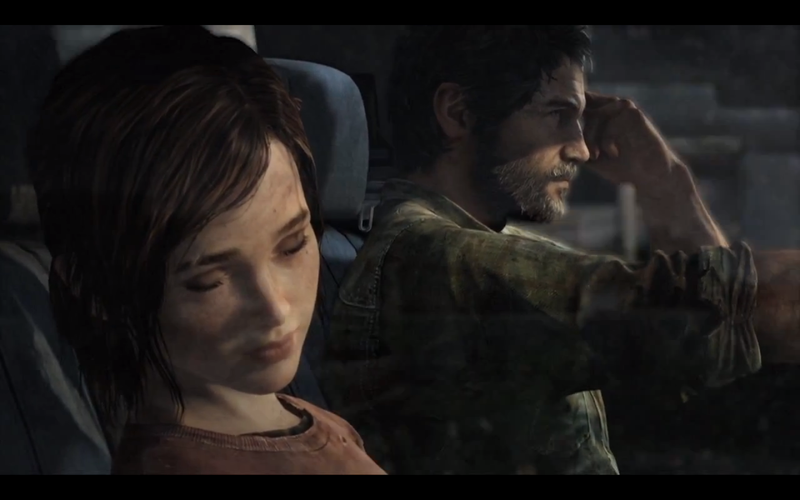 What can be said is that the heart of this story is the relationship between Joel and Ellie. Joel is tasked with protecting 14-year-old Ellie who has only known the world as it has been for the past 20 years, in decay, where man and monster pose equal threat. Joel and Ellie’s journey spans a year-long trek across a devastated and nigh abandoned United States. Along the way, the unlikely duo come across other survivors. Some of these survivors are willing to help Joel and Ellie while others have much more nefarious intentions. Naughty Dog have outdone themselves with the digital performances in The Last of Us. As performed by Troy Baker and Ashley Johnson, Joel and Ellie are quite simply the most believable video game characters I’ve ever seen. Coupled with Druckman’s amazing script, everything here is worthy of being seen on the big screen and go a long way in making a case as to why video games can and will be better than films. The quiet moments in which these two amazing characters interact are amongst its best. The art direction on display creates an amazing sense of place. Abandoned cars, offices, and homes show the artifacts of the world that was left devastated by the pandemic. The ghost town suburbs and ruined cities are in stark contrast against the scenes that take place in the woodlands and near rivers which seem almost serene and as if nothing has changed in the world. It’s a horrific depiction of America in the wake of the pandemic’s aftermath and is truly a character in and of itself. The Last of Us is a mature game in every sense of the word. The game rarely relents from its oppressive tone and gruesome violence but it never felt gratuitous. In a time when violence in video games is under heavy criticism and scrutiny, I am glad that Naughty Dog’s vision of the pandemic afflicted United States remains unflinchingly brutal and visceral. The player will see the characters enact brutality unrivaled in any game I’ve seen. If violence offends you, then The Last of Us is not the game for you. At all. You’ve been warned. Clickers are the worst. The. Worst. While the story in The Last of Us is a masterpiece, some of its design decisions leave something to be desired. The most egregious offense is in stark contrast to the world and situation that Naughty Dog, Druckman specifically, has clearly gone to great lengths to establish. Since the game takes place 20 years after the pandemic first hit, scavenging is now the order of the day. As industry has been abandoned, tools for survival must be found in the wilds of the world. Guns are of particular value as not only are there the lethal infected to contend with, but also humans. Most humans will not hesitate to kill other survivors just to pillage their wares. As an extension of this, bullets are of the utmost importance. In fact, early in the game, Joel comments on how few bullets he has, and another character tells him to make every bullet count. The game also consists of light puzzle solving that usually involves in either Ellie or Joel clearing pathways, lowering ladders, or flipping switches all to allow the other passage. Puzzles also involve swimming and floating pallets. It always controls incredibly well, but a bit more variety in the actual mechanic would have been appreciated. And having Ellie acknowledge that she is getting on a floating pallet again doesn’t make it clever, it only highlights how often this mechanic has been used. That being said, the puzzles are always realistic and feel like part of the real world, which does go a long way. Another issue that all but destroys the immersion is the partner AI. No matter how stealthily I approached any situation, Ellie and others would run right past enemies, all of which react as if there was nothing there. It’s really silly to have painstakingly navigated an area to either take out the enemies one by one, or avoid them altogether only to turn and see Ellie running next to and cross the eye line of a patrolling guard. And since this type of thing happens throughout the entirety of the game it becomes either an issue you can ignore or you can’t. In case anyone is wondering which side I fall on, it’s the latter. Enemy AI, on the other hand, is lethal, smart and always a threat. Any time I was behind cover with a flank, the enemy exploited it and I either wound up dead or close to it. Spatial awareness, cunning and use of all of the tools at your disposal are paramount to survive once the bullets start flying or when you’re swarmed by infected. It should be noted that The Last of Us is not an easy game. As already stated, enemies are smart and lethal, but there are also one-hit kill enemies on the infected side. Later on you can sink upgrade points that allow you a small window for an out but that depends on you having a shiv at your disposal. At the end of my first playthrough, on normal mind you, I died a whopping 62 times. On the other hand, death holds little consequence as The Last of Us employs an incredibly generous auto-save/checkpoint system. The quiet moments in The Last of Us are amongst its best. If I sound like I am being overly harsh on the game, it may be because The Last of Us comes so close to being a perfect game that such oversights keep bumping up against it. These issues, taken individually, could be easily ignored in light of how amazing the storytelling and characters are in the game. For me, unfortunately, I found myself treating the gameplay as means to and end to get through to the next amazing story beat or in-engine cutscene. In a game with a lesser story these issues would severely drag down the overall product so it serves as a testament to how well the presentation of The Last of Us is that I can mostly overlook these issues and still managed to love the game. Few games have managed to have the impact on me that The Last of Us has. The gameplay isn’t up to par with previous Naughty Dog releases, but with a story this well told, well acted, and well realized, it’s a minor concession overall. The Last of Us has an amazing story that everyone of appropriate age, not just gamers, should experience. It’s that good. In this day and age a review for a game has to be timely. Games slip from relevance as the next new title is released and a review outside of the first few weeks is all but a useless ego stroke in an echo-chamber. In the interest of time, I played through The Last of Us on normal difficulty. As such, my review stands as my opinion of my Normal difficulty experience. With that being said, I did play through the game on Survivor and it does much to right my most prominent complaint regarding resources. Not once during my second playthrough did I have to pass up bullets because I couldn’t carry them. In fact, I seldom had enough. On more than one occasion I had to do what I could to sneak passed every enemy, which more often than not ended in me running for my life because I made a false move. Playing through on Survival really showed me how the game was meant to be played. Without resources and without the crutch of “Listen Mode,” The Last of Us is truly the evolution of Survival Horror in a purely mechanical level. Coupled with the amazing narrative, world and characters of The Last of Us is easily elevated to a 10 out of 10. But as I said earlier, normal mode still exists and is what I played and the mechanics in the default game mode work against the narrative in an immersion-breaking way. In short, play the game on Survival if you can because it really is the way the game feels like it was meant to be played. As I played a rental copy for review I was unable to play The Last of Us multiplayer mode, Factions. Having loved the game so much I bought it and was able to spend about 2 weeks worth of in game time with the mode. Full disclosure, I am an extremely picky gamer when it comes to competitive game types. I don’t enjoy games like Halo or Gears of War in which all of the best weapons are strewn about the map and I spend more time trying to get to a good weapon than I do actually enjoying myself. I also don’t enjoy shooting bullet sponges. Lastly, I hate no respawn game types. Factions consists two 4 on 4 modes: Supply Raid and Survivors. In Supply Raid each team a pool of 20 respawns and it’s the team’s objective to drain the enemy’s respawn pool until depleted. In Survivors each player gets one life per round for a best of 7 rounds. During each match players will acquire “supplies” to be used in the in-game store to by upgrades for your weapons or your character that boost their performance in the match. Things like extra armor, or more starting bullets are but a few examples. Strewn about the map are drops that can be pilfered for crafting materials. To the best of my knowledge, which I admit is limited, is randomized. Like in single player, I had to make choices between things like an offensive tool like a Molotov or a health kit. Both games play fundamentally the same barring the limited respawns vs no respawns. Oddly enough I feel that Survivors is a much better experience. It’s more intense and fosters much more team work which is what I enjoy about multiplayer in the first place. Because the matches are so fast paced it never feels like I’m watching the back of another player’s head for an extended period of time. Wrapping the entire experience is a “story” in which the titular “Factions” – Fireflies and Hunters have “clans” in which the objective is to have them grow and thrive. Winning helps this goal, and completing in game challenges does as well. It could be something as simple as 3 pistol kills in a match or much harder ones involving being the sole survivor and winning the match. The “story” is complete after finish 12 in game weeks and having at least one clan member alive by the end of it. Each match is a day, so 7 matches is one week. You can connect the game to Facebook in order to populate your clan with your Facebook friends. It doesn’t post on your behalf and it’s really nothing more than “so and so has built an X” but it’s amusing none the less. Like I said, I’ve played for about two weeks of in game time which is 14 matches so I have a ways to go but I’ve enjoyed The Last of Us’s multiplayer and I plan to keep going back. Now if I can just get the rest of the GH crew to finish the damn single player campaign quick enough to jump in with me. + The story is incredibly well written. + It’s gorgeous to look at. -Partner AI breaks the immersion. You know, maybe I’ve been a little too hard on ya, Sean. It seems like really, the two things that kept this from being a game that sung your undoubted top praise were the two big factors we’ve been at battle about. I do understand nothing will ever be perfect. Ever. Maybe it’s just been this high I’ve had for the game that keeps the wool over my eyes. As of this point, I honestly don’t feel like the ammo and scavenging problems aren’t as much a focal point for me, but my bias runs deep, which is why I wouldn’t be great for this line. It’s been a long two years or so since The Last of Us wowed me unlike, for what I can say, most other games haven’t even come close to. I avoided everything I could getting up to launch. I knew nothing aside from Pittsburgh would be featured in the game and something taking place in a snow-covered area. Regardless, your review was a pleasure to read through and I hope we can chat about the game some more, as there is just so much content to pick apart. Thanks for reading! I definitely loved the game and see how Survivor mode fixes a lot of my issues with it but unfortunately you need to complete the game before it unlocks so the issues still stand. I’m totally down for more conversation about the game!